Michael Green Architecture (MGA) is a leader in the design of mass timber structures. The firm, jointly based in Portland, Oregon, and British Columbia, Canada, has been a pioneer in mass timber construction since the early days of glulam. Now, as mass timber technologies proliferate and gain wider acceptance, MGA is poised to make the next great leap in mass timber construction: full-fledged mass timber automation and prefabrication. “All of our projects are made from wood,” Michael Green explained over telephone, before adding that 95 percent of the firm’s work is specifically built using mass timber. The approach is due mostly to preference, as Green is a trained millworker who began his career decades ago working for renowned architect César Pelli designing “big buildings in steel and concrete around the world.” Those whirlwind experiences left the architect starved for ways to reengage with natural materials and craft, so after returning to his native Canada, Green opened his own wood-focused office. Throughout the early mass timber era, the architect was among the first to consider its widespread use and architectural potential. Today, the office focuses on utilizing mass timber elements in a variety of building types—for example, when tight urban conditions call for compact and efficient structures. The firm also works with institutional clients seeking long-term facilities and “100-year” buildings, which mass timber can easily provide. Green sees working in mass timber as “an opportunity to insert a lot of passion” into building projects that work as explorations in industrial design and are planned with a keen understanding of how they will be put together. This industrialized construction process suits Green, who explained that construction remains the last “major industry left on Earth that is still craft-oriented,” meaning that every building is built essentially as a one-off, custom prototype with none of the cost-saving benefits of industrialized factory production. That’s where mass timber comes in—building components are produced to order in controlled factory settings, where weather, temperature, and other variables are tightly relegated. The firm is currently working with technology start-up Katerra, which is looking to utilize the potentials of mass timber to automate and integrate the construction process nationwide. MGA recently completed work on the Wood Innovation and Design Centre in Prince George, British Columbia. At the time of its completion, the nearly 97-foot-tall, six-story structure was the tallest all-timber structure in the world. 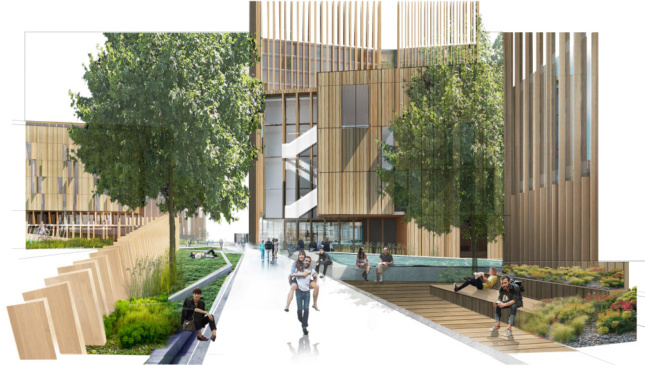 The lower three floors of the project contain facilities for students pursuing wood-focused engineering degrees while the upper floors house governmental and wood industry–related office spaces. The building is clad in an elaborate system of louvered wood shutters that are optimized by exposure to mitigate solar glare. Aside from the structure’s mechanical penthouse, there is no concrete used in the building. 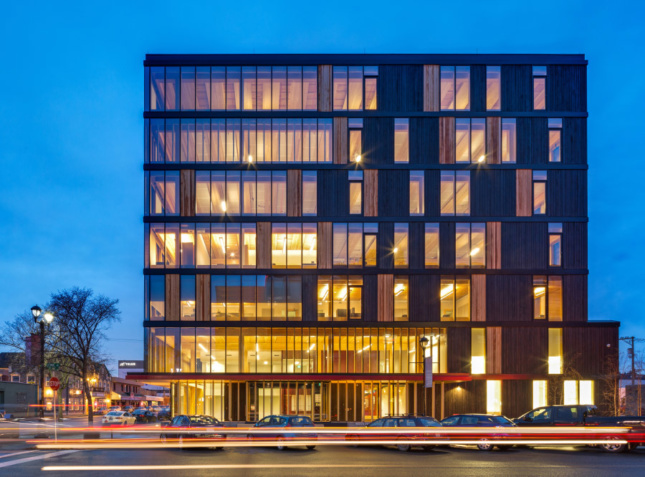 Instead, the “dry” structure integrates CLT floor panels, glulam columns and beams, and mass timber walls into a complex design that conceals electrical and plumbing services within its relatively thin floor panels. 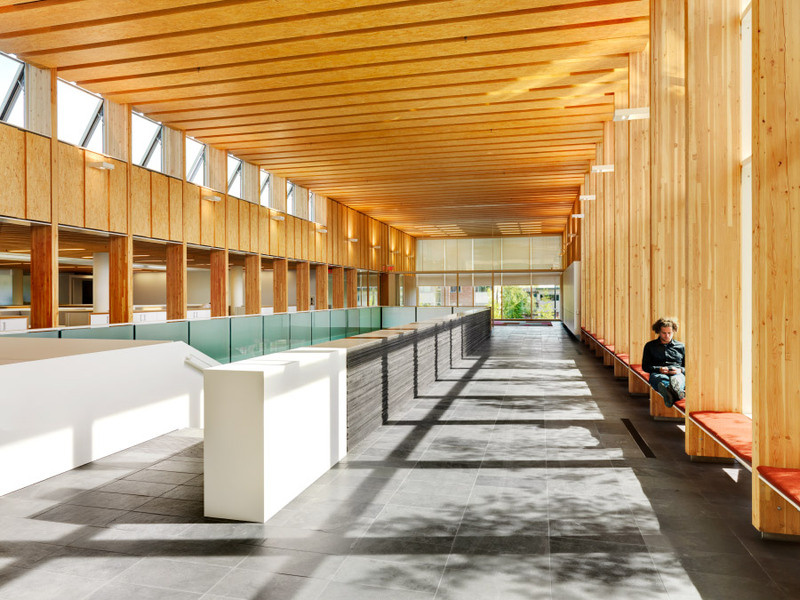 The renovation and expansion of a municipal City Hall structure in North Vancouver, British Columbia, is one of the firm’s earliest mass timber projects. The 36,000-square-foot renovation bridges a repurposed 1970s-era structure and an existing library building with a new double-height mass timber and glass atrium. The 220-foot-long space is topped with CLT roof joists propped up on large CLT columns. Where the atrium meets the existing offices, clerestory windows provide views between public and business areas. 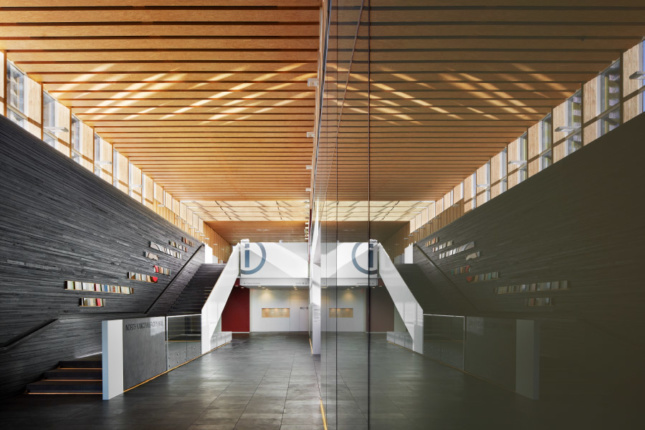 The exterior of the long and narrow addition is clad in charred wood—a material that also wraps the exterior surfaces of other building elements—creating a new and dramatic exterior courtyard. As part of MGA’s early mass wood experiments, the firm worked with Finnish wood and paper group Metsä Wood on their speculative wood initiative. For the project, the firm was tasked with redesigning an iconic steel structure using mass timber elements. 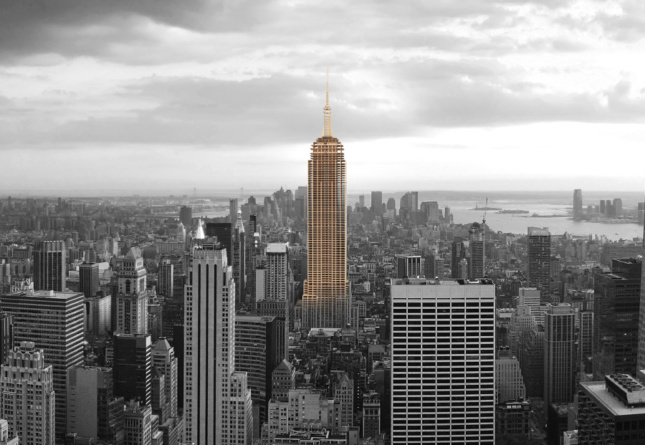 Naturally, MGA chose to envision the Empire State building as a mass timber tower, replacing steel girders and beams with glulam structures joined by metal plates. With slight modifications to the existing tower’s structural design, MGA was able to pull off a mass timber replica that matched the Empire State Building’s height inch for inch. 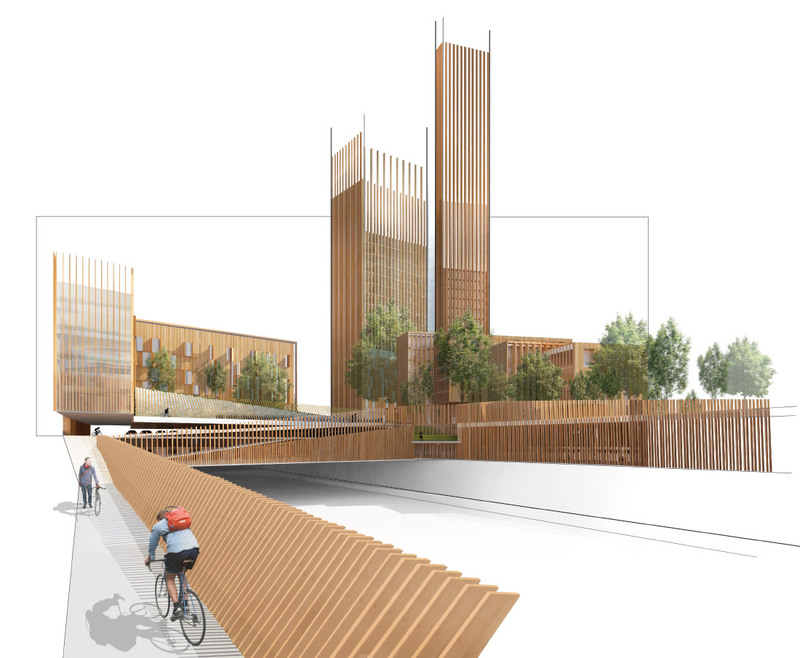 The firm’s Réinventer Paris project proposes a large-scale, 35-story mass timber tower complex that would span over Paris’s Peripherique highway belt. The innovative and speculative proposal attempts to explore a new model for high-density housing that encompasses a variety of functional uses—market-rate and social housing, a student-oriented hotel, and a bus depot—dispersed throughout a series of high- and midrise timber structures. The timber towers feature CLT columns that frame indoor-outdoor verandas, with lower buildings clad in wood louver assemblies.